Jama Masjid (Also Refered as ‘Maszid’) originated from Dongri was demolished and shifted here. The work after demolition started in late 1775 and took 27 year to get its beautiful carving, art works and the sange marmar stone work. Friday being the holy day of Namaz for islamic community is the crowded day all around. The two famous known places of Mumbai being ‘Zaveri Bazar’ and one of the oldest ‘Manish Market’ are just adjacent to this masjid. If you are new to Mumbai better take Taxi/Cab from ‘Charni Road Station (West)’, you can also reach this place from Other locations like ‘Churchgate Station’, ‘Marine Lines (marine drive) station’ and CST as well. 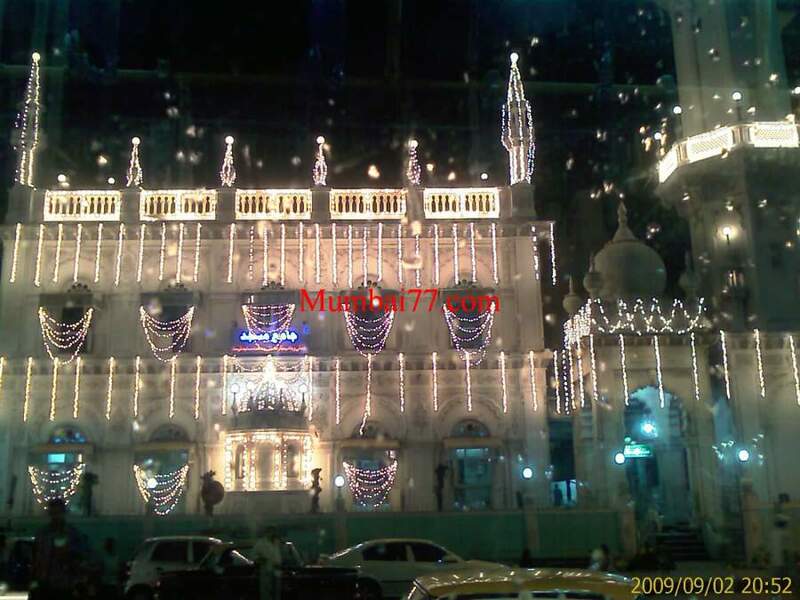 In South Mumbai this is one of the oldest and famous masjid, actually can be called as one of the heritage monument still beautiful besides crowded streets which was shifted from Dongri. Jama Masjid is a Muslim mosque quite near to Crawford market, (Now known as “Mahatma Jyotiba Phule Market”), a very special Holy place of worship for Muslims and one of the Monuments of Mumbai. Lohar Chawl, Kalbadevi Market, Crawford Market, Mumbadevi Temple, Zaveri bazaar (Jewelery market), Pydhonie, Mohammad Ali road. Yes their is another muslim mosque at western suburb of Mumbai called Bandra, In west side just near to station is another dargah called Jama Masjid Of Bandra’ picture below. You must not miss Haji ali dargah which is inside the sea of Mumbai. Also if near around Mahim station in western route, Mahim dargah is one special holy place to visit.